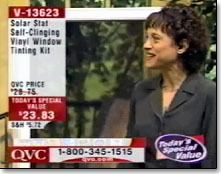 Sharon Geller has been appearing as a guest host on QVC-TV for over nine years. Originally hired in the home improvement area, for the last four years Sharon has specialized in the gift and novelty category and can be often seen as a spokeswoman on QVC anywhere between one and ten times a month. To see her in action, just click on picture to play clip.